There are many areas in which we play a positive role in supporting the community and environment that we work and live in. We don’t profess to be able to change the world alone, but feel it is our responsibility to do our bit and do so in various ways. We were awarded an Energy Efficient & Low Carbon “C” rating in 2017 for our Head Office building, recognising the steps we have taken to reduce energy consumption. We also employ the services of an external supplier to shred and recycle all of our paper materials and are part of a local scheme for waste collection to be recycled. This scheme uses a compactor, which minimises cost, waste volume, vehicle movements on site and reduce carbon footprint. Our people work closely as a team to ensure we deliver a high level of service to our clients and support each other to get the job done. We reward hard work, providing the opportunity for talented and enthusiastic individuals to thrive in their chosen careers. We are committed to ensuring our people look to develop their business and personal skills to assist with building a long-term career. This strategy consists of attending various workshops and networking events, as well as web based learning. We are proud to have an entirely non-discriminatory working environment and offer our people equal opportunities to succeed, which is fundamental to the continued success and ethos of our business. We are passionate about our commitment to the community and have invested time and money to various initiatives over the past few years. We are regularly involved with Scannappeal initiatives and have sponsored 5 of their events over the past 3 years, including an Evening with Johnny Herbert, an Evening with Phil Tuffnell and an Evening with Mike Tindall, as well as their Summertime Swing Jazz Evening and annual charity Golf Day. All of these events have helped raise money for much needed equipment, such as a tsympanometer, that provides advanced diagnostic tests for patients with hearing problems and a breast screening machine that has been installed at Wycombe General Hospital. Butterfly House is a leading community resource for supporting patients and their families living with life limiting or life threatening illnesses. They offer patient centred care to individuals through the provision of specialist palliative, psychotherapeutic and lymphoedema care. Alan Chandler, Director at Chandler Garvey is a Trustee on the Board of South Bucks Hospice and was involved in the creation of Butterfly House, a leading community resource for supporting patients and their families living with life limiting or life threatening illnesses. They offer patient centred care to individuals through the provision of specialist palliative, psychotherapeutic and lymphoedema care. Alan is on the committee, organising a Butterfly Ball to raise more funds to help patients at the hospice. Alan Chandler is also involved with the Lions Club, who’s mission statement is to empower volunteers to serve their communities, meet humanitarian needs, encourage peace and promote international understanding through Lions clubs. Alan can be seen dressed as Father Christmas outside Tesco in Aylesbury during December, raising funds and awareness to the local community. Michael Garvey, MD of Chandler Garvey, is one of 10 business people that formed Buckinghamshire Business First in 2011. He was recently appointed Chairman and the organisation now has more than 11,000 members and actively engages with at least 50% of the members annually. Their aim is to make Buckinghamshire the best place to start, run and grow a business. Michael has committed significant time to a range of related activities and is currently the Chair of the Connected Counties Broadband project, Chair of the Digital Infrasructure Group, a Board member of Buckinghamshire Advantage, Chair of the Buckinghamshire Enterprize Zone Board and a member of the Local Transport Board. The Thames Valley Air Ambulance deliver treatment that would normally only be available in a hospital, by taking advanced medical care and expertise to a patient, saving time when minutes matter on a proo bono basis. We acquired and negotiated a favourable lease for new offices in Stokenchurch and disposed of their old offices in High Wycombe. We were shirt sponsors as part of the Chiltern 100 Festival, for Action4Youth, who are a youth charity, who provide positive experiences an activities which inspire children and young people. Their aim is to enable young people of all abilities and disabilities to learn to challenge themselves and work with others, focussing on what they can achieve, rather than what they can’t. Chandler Garvey staff are also active in setting themselves challenges to raise money for worthy causes and have been known to climb the Three Peaks raising over £1,600 for Bloodwise, complete the Walk the Walk Moonwalk Marathon for breast cancer, walk Hadrian’s Wall, raising. money for the Alzheimer’s Society and this year, cycling the Prudential Ride London 100 mile route, raising money for Youth Minds mental health charity in August 2019. In our 12 Days of Christmas campaign in 2017, the winner was given a £500 donation from Chandler Garvey to a charity of their choice, which went to the Macmillan Cancer trust. In our HatsWhereItIsCompetition Christmas Campaign in 2018, the winner donated their £500 cheque from Chandler Garvey to the Wycombe Homeless Connection. We recognise that we have the capacity to help shape the built environment through the work we undertake for investors and developers, but equally recognise that we should give something back to the community within which we live and work and try to lead by example in our sector. 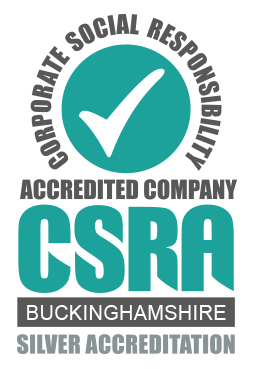 We are delighted and proud to announce that Chandler Garvey have been awarded a Silver CSR Accreditation by the CSRA.